1. 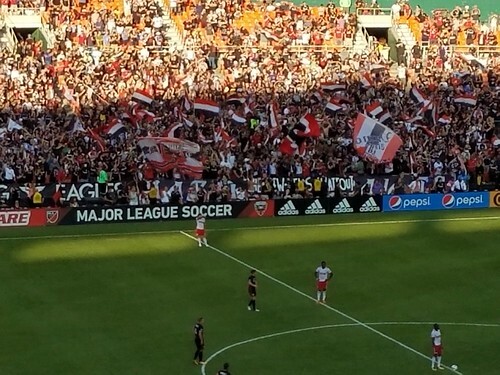 Friday afternoon, Michael texted to say that he thought we should have a group outing for the final professional sporting event at RFK Stadium — a D.C. United soccer match. (Other teams to have played at RFK: the Senators, the Nationals, the Washington [racist name redacted] football team, the Freedom, and both men’s and women’s World Cup national soccer teams.) The arena was looking a little dingy, but the fans were enthusiastic, the first half of the match was solid, and it was a fun way to spend a Sunday afternoon. 2. 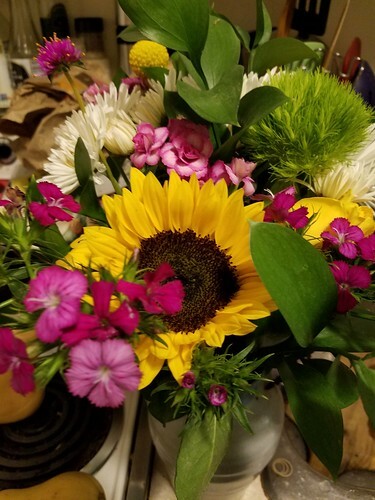 Last week ended with a second bouquet from the vet’s, which I’m guessing was a mix-up, but which was still lovely and appreciated. 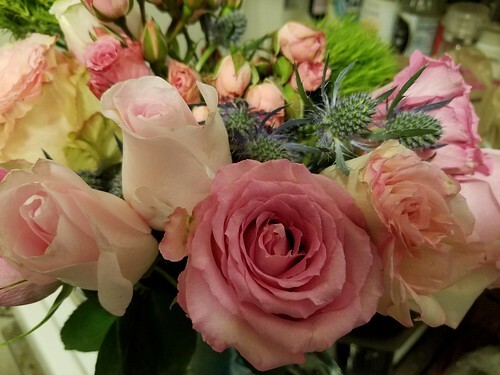 On Saturday, we went to the opening of a new shop/cafe which carries things only made in D.C., and the owner pressed a bouquet on us as were leaving. Twist my arm, why don’t you? 3. After a warm start to the week, temperatures have finally dropped again, giving a much more seasonal feel to outdoor time. Wool socks and accessories have been broken out, as have blankets, cats are extremely cuddly, and I poached quince last weekend. Soup is next on my agenda and my long-fingered bike gloves will need to be found and put back in my purse for impromptu nighttime cycling. Submit one book recommendation published in each year of the Readathon (2007-2017). Do you have any favorite books from that time period? Today I’m taking part in the 10th anniversary of Dewey’s Readathon. I’ll be spending a nice portion of my day reading, but it’s not going to be all 24 hours. For instance, I neglected to set my pre-8 a.m. alarm, so am only just getting started now. At some point early this afternoon, my partner Rudi will come home from work and I’ll break with reading to bike up to one of our local libraries, check out their book sale and new Michelle Obama photo exhibit, and then investigate a new cafe in the Mount Pleasant neighborhood. I like to read (obviously), knit, listen to music, and play with my two cats, Jeremiah and Corey, both of whom are hanging around waiting for me to give them breakfast. I like YA and middle-grade novels, less depressing literature, cozy mysteries, memoirs, and some fantasy. I think this is my fourth readathon, and mostly I’m not going to stress about it, because it’s supposed to be fun. If at any point it stops being fun, I’ll dial it back. Check out other people writing about Three on Thursday at Carole Knits. Our WiFi is down so this will be a quick post. As you can see, I’m on the cuff of Little Pumpkin sock #2. Rudi will be working a bunch the next few days, so I expect to get another good chunk done by the weekend. I finished the audiobook of Daniel José Older’s Shadowshaper tonight & highly recommend it if you’re looking for an urban contemporary ghost story for this season. 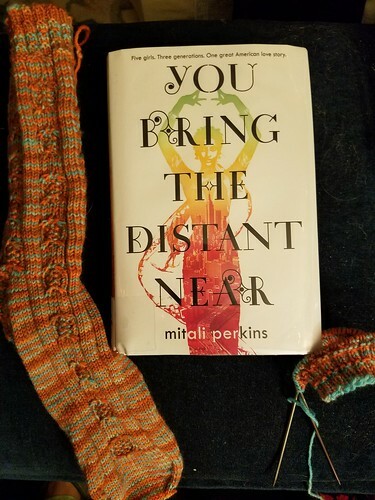 Up next is another book set in the immigrant communities of NYC: You Bring the Distant Near, which I started last weekend. So far, so good. 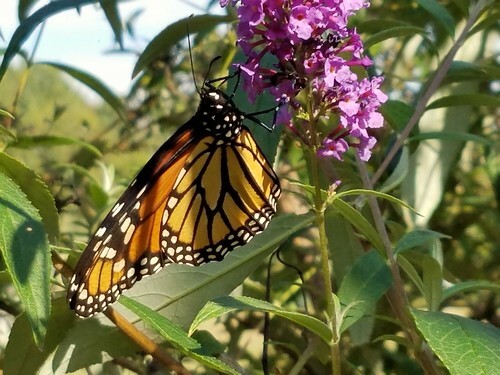 Check in on other Unravelings at Kat’s blog. It’s the first week of Coffeeneuring, the annual informal holiday period in which people ride bicycles in pursuit of hot drinks. So I’ll be doing that. Maybe twice. I have a dvd that didn’t get unlocked when I picked it up and I have books on hold, so a trip to the library is in order. We’re now in mid-October, so it’s fair game to hang up my Halloween lights. We’re nearly out of milk and eggs and probably need greens, so the farmers market is on the agenda for Sunday morning. We’re also out of cat litter, so that means a trip to the store. I chopped off my hair ten days ago and am still lacking in hair gel for my short ‘do. I’d like to rectify that. There is a mountain of laundry in the bedroom. Either we have to wash some of it or name it as a significant geological feature of the area. I think I can finish either the edging of my shawl or Little Pumpkin sock #1. Apparently, today is National Dessert Day. While I’d like to make a dessert, I’ll settle for eating some. The Freer/Sackler Galleries of the Smithsonian are putting on IlluminAsia this weekend. 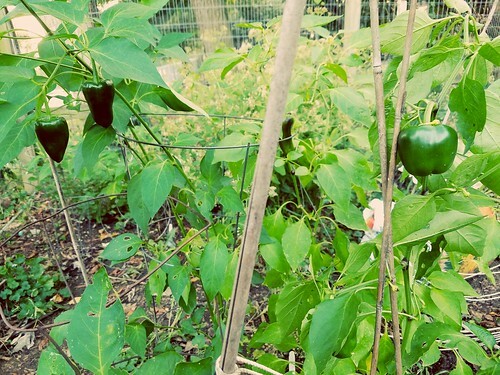 No one has checked on the garden in a week. Probably someone should do that. Probably that someone will be me. I need to get to a yoga class before my pass expires. Complete my Cybils nominations before tomorrow night’s deadline. Trombone Shorty is playing at the new Anthem club down at the Wharf development along the river. He’s been on my like-to-see list for a while and tickets are reasonable, so maybe we’ll go check him out. How about you? What are you hoping to do this weekend?